Domain names give you your own 'address' on the internet. They allow people to type in your address (URL) and go straight to your web page. Domain names are split into two parts: the domain name (e.g. warewelchwebhosting), and the domain extension (e.g. .com). When buying a domain we allow you to check to make sure that the domain you have chosen is available and has not already been registered by someone else. We offer a wide variety of domain name extensions (see the table below). The price of a domain name depends on the type of extension you choose and the length of time you want to purchase the domain for (1 to 10 years in most cases). We offer free .co.uk, me.uk and. 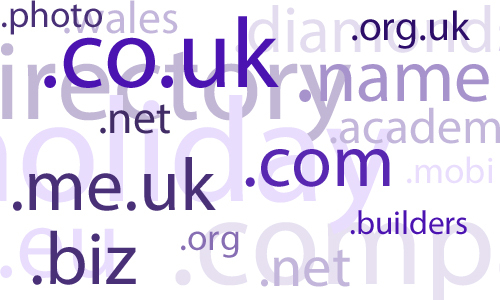 org.uk domains with some of our hosting packages. These domains are renewed for free each year as long as you continue to pay the yearly charge on the hosting package associated with the domain. For information on which hosting packages come with a free domain name please see the hosting page. If you already have an existing domain and you would like to use it with our hosting packages you have two options. You can either leave the domain with your current registrar and change the nameservers so that you can use our hosting packages. Transfer the domain to us so that future domain renewals will be with us and use our hosting packages. Depending on the extension of the domain, the transfer will either be free or incur a transfer cost. The transfer costs for domains are listed in the table below. We provide full instructions on how to transfer your domain from your current registrar if you wish to do a full domain transfer. Alternatively we can guide you in changing the name servers so that your domain remains with your current registrar but your hosting with us. Keep it short, keep it simple. To find your site, people need to be able to remember your address and easily type it into their browser. Aim to register the shortest name that your visitors will associate with your website. Most domain names can be purchased for a period of 1 to 10 years. when purchased with some Hosting Packages. we add 1 FREE year to your renewal date. If you need any more information about any of our domains or domain transfers then please contact us.